Here is my official Field Test Shooting Video Review for my KWC Sigma SW40F CO2 Blowback BB Pistol. Make sure to checkout my previous Table Top Review for more details on the KWC SW40F 4.5mm BB version where I also did a pre-test showing some similar results. My 5 shot Chronograph test resulted in a somewhat expected 285 average fps while my accuracy test shot from 20 feet out in a semi rested position received a slightly wider 3 inch group this time but with most shots being within 1 inch of each other. In terms of shot placement the KWC SW40F 4.5mm BB Pistol shot very well centered but just slightly low. I also only got 2 full magazines this time around so don't expect a lot of shots per CO2 with this 4.5mm BB pistol. 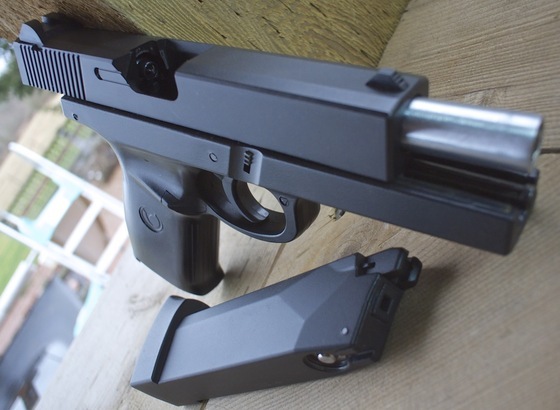 Overall, the KWC SW40F 4.5mm BB Pistol is a really fun gun to shoot with a very crisp heavy slide that gives a nice firm blowback snap to it. It is one of the nicer sounding slides with a less tinny sound than most. The fps and shots per CO2 is a bit low but other than that performance is very good, you will have no problem nocking down cans and acquiring other miscellaneous targets.